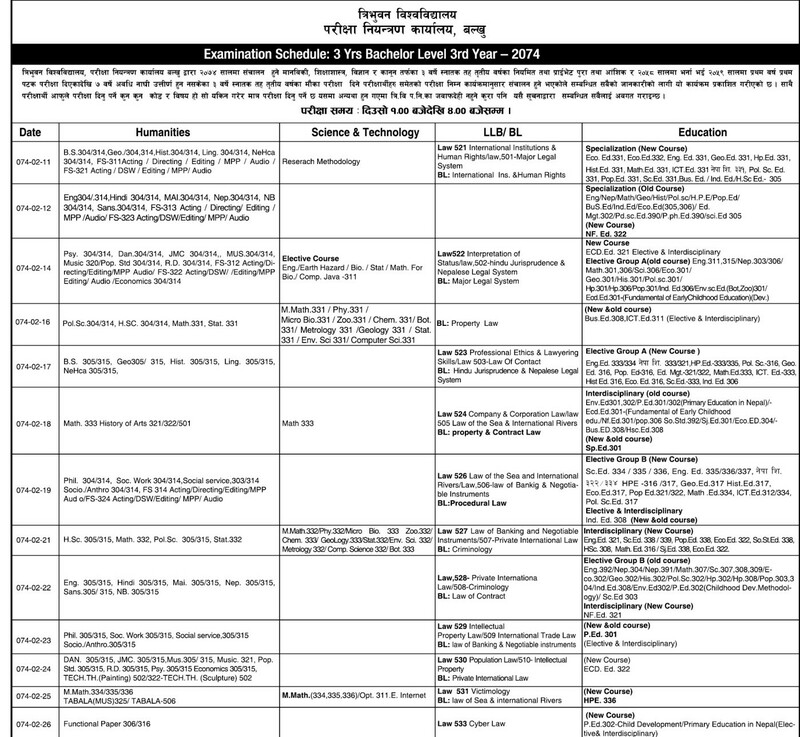 Tribhuvan University office of the controller of Examination Balkhu today publishes the examination schedule of 3 years Bachelor level (Humanities, Science & Technology, LLB/BL, and Education Faculties) for both regular, private, full, partial and chance examination. The examination will start from Jestha 11 and will end on Jestha 26. Examination time 1 to 4 pm. Update 30th April: The examination of 3 years B.Ed third year PED.301 Old Course (Inter Disciplinary) will take place on Jestha 23 instead of Jestha 18. Special Notice to fill exam form: Eligible students who have failed to submit the application in the earlier mentioned deadline can submit the form paying double fee contacting their college/campus from today. Such colleges/Campuses have to submit the application fee fulfilling all criteria within Baisakh 19, 2074. Private students can submit their forms directly in exam controller office in Baisakh 17 and 19.